10:40am I receive an email from a network president asking when I might “have a second to chat.” He must not be following me on twitter today. 10:45am Diaper still not changed. 10:51am I ask Sabine a simple question: what’s that on your face?! I eventually got it off, but I honestly don’t know what it was. 11:00am No more Mickey. We’re now watching Sportcenter. I gently explain to Sabine that from now on, her only cartoon mouse options are Speedy Gonzales, Jerry, Pinky, or The Brain. 11:05am Diaper changed. Wow. I had no idea momma had Sabine on a high-fiber diet. 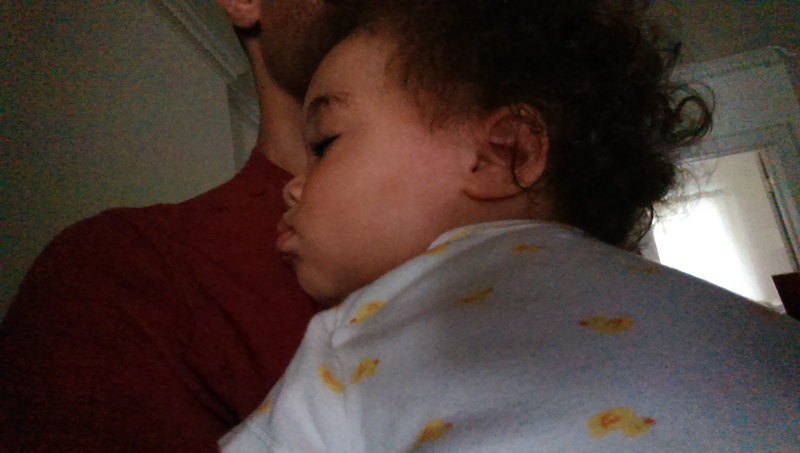 11:12am Pick up Sabine, and she immediately rests her head on my shoulder. 11:20am Little one is sleeping. I have at most two hours to get work done. 11:28am This nap won’t last long if my upstairs neighbor keeps dropping s— on the floor!